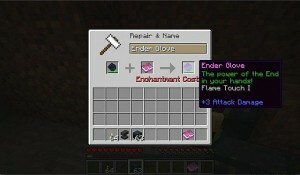 The power of The End is in your hand with Surseance’s mod, EnderGlove! This mod was made for Modjam on Planet Minecraft, and only introduces one item to the game – but it is a spectacular item different from any other you’ve seen before. 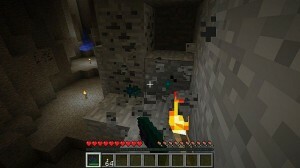 Essentially, the Ender Glove acts as a combined diamond pickaxe and a mobile Ender storage device. Mining blocks with the Ender Glove equipped will put the block (or resulting item) in your Ender inventory, even if no Ender Chest exists in the world yet. *Creative – sets a location via shift+right click. Whenever the player hits an enemy with the Ender Glove afterwards, they will be teleported to this block. Enchantments marked with an asterisk are not yet available in the mod. 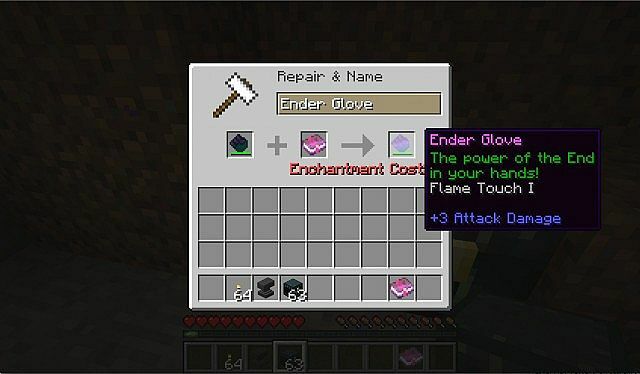 Obtaining the Ender Glove can currently only be done through creative mode, though in the future it will have an easy crafting recipe for easy mode. In hard mode, the glove will only be able to be obtained by finding “End Totems” spread throughout the world. Download the latest version ofEnderGlove. The Ender Glove promises to be an extremely interesting and useful item. I am particularly interested in its Creative enchantment. Can you think of any interesting ways to use the glove? Leave your ideas in the comments!